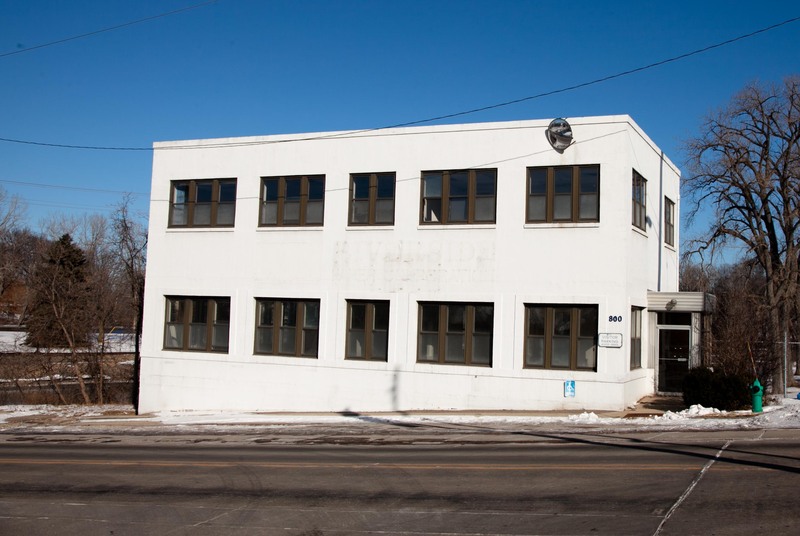 Posted on Mar 2, 2015 by Appleton Downtown Inc.
Big changes are in store for the historic office building at 800 S. Lawe Street overlooking Lock 3 on the Fox River in the Appleton Flats! The 5,200 square-foot, white building will become “The Draw,” a venue for artists, creatives and patrons of the arts to work and socialize. The building served as the corporate offices for the former Riverside Paper Corporation since the early 1900’s. In 2011, the Riverside Paper Mill across the street was demolished to prepare the site for a new mixed-use residential neighborhood called Eagle Flats. Today, Eagle Flats is an emerging riverfront hub with more than $4 million in new tax base and two successful apartment buildings. For two years, Stadtmueller & Associates has been researching potential redevelopment opportunities for the former corporate offices. After considering several different uses, they decided to pursue a gallery/studio venue to support Appleton’s creative placemaking objectives. “Downtown Appleton is doing great things to enhance the cultural environment through access to arts, music and cultural activities. Our goal is to support this effort by extending these opportunities to the riverfront,” said Renee Torzala, Stadtmueller & Associates. Developers estimate renovation costs to be at least $300,000 to replace the roof, install new mechanicals and restore the interior/exterior of the building. Multiple artists and creative professionals have already provided letters of intent to lease space inside The Draw, which is expected to open in the spring of 2015. The vision for “The Draw” was the mastermind of two local creative professionals, John Adams and Jackie Johnson. They approached Stadtmueller & Associates about creating a multi-functional, flexible space that could serve as a modern art gallery, office space, and art studios. Their plans also include a variety of community-supported rooms, such as a darkroom, kiln room, art library and pop-up coffee shop. Adams will serve as the gallery curator and manager. “The building and its tenants will put an emphasis on fostering relationships between the Appleton Area School District, Lawrence University and other independent arts and education resources,” said Adams. “We will bring diverse people together to celebrate, create, inspire and be inspired,” he said. John Adams grew up in Appleton, graduating from Appleton North High School in 2000. From there, he pursued his passion of film making, attending Full Sail University in Winter Park, Florida, where he earned a degree in Film and Video Production. He has spent the last 13 years working in the commercial film industry in Chicago (commuting from his home in Appleton for the last seven years). Since welcoming a daughter in 2013, he has felt his focus shift to spending more time in Appleton, and working to create an artistic environment where he and his family can prosper, along with the rest of the community.